I host the "Hidden Treasures Of Rock''n'Roll Show", Mondays from 12-2 PM CST at www.uicradio.org . The First Show Of March! It’s always great to see March arrive after living through another February in Chicago. This past month tied for the second coldest February ever, so March has to be an improvement. Let’s start it out with some great music on this week’s show. I will be featuring the music of three artists born during the week, a classic album released 45 years ago this week, and a great band playing a sold-out show this week in Chicago. The first featured artist is ROGER DALTREY of THE WHO, 71 years old today. Roger is one of rock’n’roll’s greatest vocalists and still playing live with The Who. The second featured artist is the great LOU REED, born 73 years ago tomorrow in 1942. Lou passed away in 2013 at the age of 71, but his music, both solo and with The Velvet Underground, lives on. He is surely one of the most influential artists ever in rock’n’roll history. Our final featured artist is ARTHUR LEE of LOVE, born 70 years ago this week in 1945. Arthur passed away in 2006 at the age of 61, but his music continues to influence artists today. Love’s masterwork. “Forever Changes”, is one of the best albums ever released. This week’s featured album is MOUNTAIN’s debut, “Climbing!”, released 45 years ago on March 7, 1970. It’s a great debut and there isn’t a bad song on the LP. Finally, I will be featuring the music of THE CHURCH on this week’s show. They play a sold-out show on Friday at the Double Door in Chicago. They are, of course, best known for their hit, “Under The Milky Way”, but they have created a great body of work over the years and put on a fantastic live show. I hope you can join me tomorrow (Monday), 12-4 PM CST at http://uicradio.org/ ! Moondance was inducted into the Grammy Hall of Fame in 1999 and has continued to be a highly acclaimed album in the 2000s. Over the years, it has been featured on several prominent lists of best albums of all time. In 2001 the TV network VH1 named this album #32 on a list of the greatest albums of all time. In 2003, It was listed as #65 on Rolling Stones list of the 500 Greatest Albums of All Time. Moondance was voted #20 on the 2005 list of 885 All Time Greatest Albums by listeners on WXPN. In November 2006, CNN published their list of “The All-Time 100 Albums.” Moondance was listed among the 100 albums along with Astral Weeks. In March 2007, it was listed as #72 on the NARM Rock and Roll Hall of Fame list of the “Definitive 200”. In December 2009, it was voted #11 top Irish album of all time by a poll of leading Irish musicians taken by Hot Press magazine. When I listen to an album for my show, I make notes on each track concerning their tempo, etc., and also give a rating to each track. A great song, one that I would always play on the show, gets a ++ rating. Of the 10 tracks on “Moondance”, I would rate eight as ++ tracks and the other two at the next level, +3/4. It’s certainly one of my favorite albums, and one I know you will enjoy as well. I will be featuring it on my show Monday, 12-4 PM CST at http://uicradio.org/ . I hope you can join me! Alex Harvey, the leader of the Scottish rock band The Sensational Alex Harvey Band, was born 80 years ago next week on February 5th, 1935, just a few weeks after Elvis. He died 33 years ago next week on February 4th, 1982, one day short of his 47th birthday, the victim of a heart attack. I first encountered Alex and the SAHB in the mid-70’s on the ABC late night rock show, “In Concert”. “In Concert” was a great series, and often featured new music from artists not yet known in the US. It’s where I discovered Roxy Music for the first time, doing a great version of “Song For Europe”. But I digress… Alex and the band appeared on the show, doing their song “Vambo Marble Eye” and I immediately became a fan. They were part of the “glam rock” scene, but had a heavy foundation in rhythm and blues. By this time, Alex was almost 40, but he had an undeniable stage presence and a theatrical flair. They never became big in the US, except in Cleveland, where they were headliners. At around the same time that I encountered them on “In Concert” the SAHB played the Ragnarock Festival in Norway, where this performance was filmed. Alex and the SAHB put their own special twist on the Leiber/Stoller classic “Framed’ The Norwegian hippies seem a bit perplexed by Alex and band, but sit back and enjoy the show, featuring a great guitar solo by Zal Cleminson. Oh, and I will be featuring the band on Monday’s show, 12-4 PM CST at http://uicradio.org/ for Alex’s 80th. John Sebastian co-founded the Lovin’ Spoonful in early 1965, following brief (and sometimes simultaneous) tenures with the Even Dozen Jug Band, the Mugwumps, and as a session musician for Elektra Records (perhaps most notably on the label’s 1964 sampler The Blues Project, which also featured Bob Dylan). Signed to the MGM-distributed label Kama Sutra Records, the Lovin’ Spoonful enjoyed considerable success during 1965-67, scoring consecutive “top 10” chart hits with its first eight singles. By late 1967, however, the band’s popularity had begun to wane, and in early 1968 Sebastian decided to leave the Spoonful to pursue a solo career. He quickly began writing the songs that would comprise John B. Sebastian, and making arrangements for recording sessions. Ten new songs were ultimately included in the album, as well as a solo acoustic version of “You’re a Big Boy Now,” which Sebastian originally wrote and performed with the Lovin’ Spoonful in 1966 in support of Francis Ford Coppola’s film of the same name, and which also appears in the latter film’s soundtrack album (Kama Sutra catalog no. KLP/KLPS 8058). Sebastian’s choice to produce John B. Sebastian was an old friend from his days at Elektra Records, Paul A. Rothchild. Rothchild, previously a longtime Elektra staff producer, had by mid-1968 become well-known from his work on the Doors‘ first three albums, Love‘s Da Capo, and the Paul Butterfield Blues Band‘s landmark album East-West. John B. Sebastian would be one of Rothchild’s first projects as an independent producer, but as both Rothchild and Sebastian maintained good relationships with Elektra founder Jac Holzman, most of the album’s recording sessions would be convened at that label’s Los Angeles studios. The album was the first of three Sebastian solo projects Rothchild would produce; Holzman is acknowledged with a “special thanks” credit in John B. Sebastian’s liner notes. In selecting musicians to work with on the album, Sebastian likewise looked to friends from his pre-Lovin’ Spoonful days as a New York session man; he would later be quoted as saying “I wanted this opportunity to play with the same guys I’d been playing with when we were all broke … Dallas Taylor, Steve Stills, Harvey Brooks, Paul Harris.” In particular, Harris’ work as a keyboardist and arranger on John B. Sebastian would begin a three-year working relationship between Harris and Sebastian. Other notable musicians of the period, including David Crosby, Graham Nash, Danny Weis and Buzzy Linhart, would also contribute to the sessions. Recording for John B. Sebastian was completed during the autumn of 1968. By December, Kama Sutra and MGM began planning the album’s release, assigning it a catalog number (Kama Sutra no. KLP/KLPS 8069) and commissioning album cover artwork. The album’s first single, “She’s a Lady” b/w “The Room Nobody Lives In,” was also issued in December 1968 (Kama Sutra catalog no. KA-254). The single’s release was accompanied by photo advertisements in the music industry trade papers Billboard and Cashbox that called “She’s a Lady” the first of “an incredible new series of songs now being written by one of the most creative composers of contemporary rock.” The single performed disappointingly despite the advertising campaign, peaking at #84 on the Billboard chart. Sheet music copyright listings for the songs “I Had a Dream” and “Baby, Don’t Ya Get Crazy” suggest that those songs may have been considered for release as a second single from the album. However, while additional singles from John B. Sebastian would be issued following the album’s eventual release in 1970, these songs were not among them, and no further singles from the album – nor any further John Sebastian material of any kind – would be issued on the Kama Sutra label. Two events took place in early 1969 that together would work to delay John B. Sebastian’s release: the disbanding of the Lovin’ Spoonful, and Kama Sutra Records’ terminating its distribution agreement with MGM Records. Neither event was completely unexpected. The Lovin’ Spoonful had struggled to maintain a presence on the pop charts after Sebastian left the band, and broke up after their last album Revelation: Revolution ‘69 (Kama Sutra catalog no. KLP/KLPS 8073), fronted by drummer/vocalist Joe Butler, failed to chart. Kama Sutra’s relationship with MGM began deteriorating in mid-1967, when Kama Sutra’s owners founded a new label not affiliated with MGM, Buddah Records. The Buddah label developed a strong identity in 1968 through its association with the bubblegum pop music genre, with new artists that might previously have been contracted to Kama Sutra/MGM now being routed to Buddah instead. Following the above events, MGM Records contacted Sebastian and his manager, Bob Cavallo, to advise them that they now planned to release John B. Sebastian on the MGM label (catalog no. SE-4654). They also made an unexpected request, asking Sebastian to rebrand his album as a Lovin’ Spoonful record. MGM’s rationale for the request was twofold: they claimed that the now-defunct Spoonful still owed the label an album under their contract, and thought a new Lovin’ Spoonful album featuring Sebastian would be more marketable than a John Sebastian solo album. Having left the Spoonful a year before, Sebastian felt no obligation to cover their contractual commitments, and declined, telling MGM that rebranding his album as a group effort would be “incredibly dishonest” to potential record buyers. Reprise would subsequently commission new cover art for John B. Sebastian including photographs taken during Sebastian’s Woodstock set, and Reprise’s sister label Cotillion/Atlantic Records would include two songs from the set also featured in John B. Sebastian, “I Had a Dream” and “Rainbows All Over Your Blues,” in their soundtrack album of Michael Wadleigh’s documentary film of the festival Woodstock (1970). A further cause of frustration – and potential public confusion – was MGM’s releasing its own version of John B. Sebastian shortly after Reprise did (catalog no. SE-4654, the same number issued to the album by MGM in early 1969). MGM’s version used the album’s originally commissioned cover art, and contained similar liner notes to the Reprise version (with some inaccuracies; in particular, bassist Harvey Brooks’s name is consistently misspelled as “Brooke” on the MGM cover). Warner/Reprise would quickly sue MGM for copyright infringement over their issuing a recording they no longer had contractual rights to; MGM claimed in response that the Lovin’ Spoonful’s owing them an album, plus the marketing support they gave to the Kama Sutra single release of “She’s a Lady,” gave them the right to release John B. Sebastian despite the artist’s no longer being associated with them. The lawsuit was adjudicated in Warner/Reprise’s favor in late 1970, but not before MGM released a second, unauthorized album taken from a July 1970 John Sebastian concert performance, John Sebastian Live (MGM catalog no. SE-4720, released September 1970). Both MGM’s version of John B. Sebastian and John Sebastian Live were pulled from the marketplace upon settlement of Warner/Reprise’s suit; John Sebastian Live has never been reissued, but its release would inspire Sebastian, Paul Rothchild and Paul Harris to record a live album as Sebastian’s second Reprise project (Cheapo-Cheapo Productions Presents Real Live John Sebastian, Reprise catalog no. MS 2036, released March 1971). You can see how crazy things got, but it’s a fine album, in my opinion the best solo work that Sebastian has released. I will be featuring the album on this Monday’s show, 12-4 PM CST at http://uicradio.org/ . I hope you can join me! I miss the days of the late 60’s and early 70’s when I would browse the cut-out bins at the Woolco in Muscle Shoals, the K-Mart in Florence, or the Big K in Sheffield. You never knew what you might find, and sometimes you got very lucky. Regular LP’s cost around $3.50 at the time, and generally you could find cut-out albums from 49 cents up to $1.99. Sometimes you just took a leap of faith, based on an interesting cover, a musician or producer you recognized, or a review from Rolling Stone that you remembered. Here are some albums that I found that I have loved all these years and and thankful that they have been in my life. 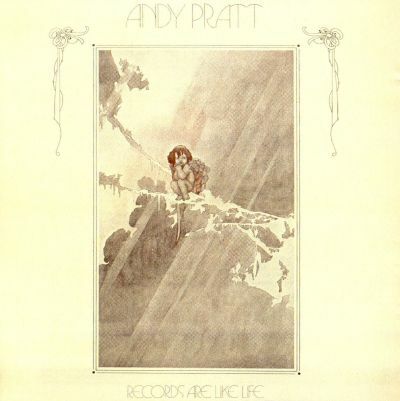 Andy Pratt–“Records Are Like Life”–I love every track on this album and have subsequently come to enjoy the rest of Andy’s work over the years. This was his first LP and it’s wonderful. 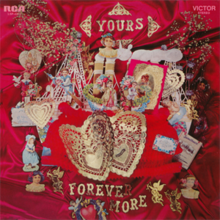 Another great find was the debut from the Scottish band, Forever More, “Yours-Forever More”. Several of the members went on to form the Average White Band, but this sounds nothing like that. It’s an imaginative album, and much better than their second album. Another album that I love to this day is the debut and only album by Bo Grumpus, “Before The War”. It was produced by Felix Pappalardi and included his song “Travelin’ In The Dark” which he later re-recorded with Mountain. With a name like Bo Grumpus, they had to be good, and it’s a great album. The band did one other album under the name Jolliver Arkansaw, which is not as good. (Apparently they weren’t as good at picking out band names as they were at making music.) 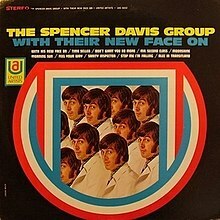 One last LP that I found was The Spencer Davis Group’s “With Their New Face On”. The Spencer Davis Group was a very popular English band and had many hits with their teenage wunderkind Steve Winwood. When Winwood left the band to form Traffic in 1967, he was replaced by two musicians, keyboardist/vocalist Eddie Hardin and guitarist/vocalist Phil Sawyer. They released “Face” in 1968, and it’s a wonderful album that sounds eerily like Traffic, in a good way. It also included “Don’t Want You No More”, which a year later was covered by The Allman Brothers Band as the first track on their debut. I could go on forever, but I hope you will check out these “Hidden Treasures” and perhaps you will be “thankful” too. Happy Thanksgiving! I have been doing the “Hidden Treasures Of Rock’n’Roll” show for over 14 years now, since UIC Radio went on the air in 2000. We DJ’s now are requested to blog about our shows, so I thought I would explain how it has evolved in that time, and how each week’s show is put together. Originally, I did two different shows, from 12-2PM I played new music and from 2-4PM I could play whatever I wanted. Most people only do two hour shows, so when I signed up for 12-4 PM on Monday afternoons, the powers that be at the time, divided it into the two different shows. I like playing what I want to play, so after a few months of this, I asked if I could just do one show and play whatever I like, and they agreed. I’m not sure when I hit upon the current format of the show, but after a bit, I decided to do the show based on the rock’n’roll calendar, featuring different artists on their birthdays and albums on the anniversary of their release. That way the show stayed fairly fresh, and you didn’t hear the same artists over and over. The reason I decided to do a show when UIC Radio started was my frustration with broadcast radio, especially classic rock stations that play the same 100 songs over and over. Frankly, if I never heard “Stairway To Heaven” again, I would be OK with that. So each week, there are five different features (artists or albums) and they are rotated throughout the show. Why five? Any more than that, and I wouldn’t do justice to the featured music. Some weeks it’s really hard to narrow the features down to five, and there are occasional weeks where it is hard to find five features, but generally the problem is too much great music in a week, rather than not enough. I also have artists in for interviews and live acoustic sessions, so that is an extra feature on those weeks. Between the featured music, you will hear new music from artists, local and from around the world. that have sent me their music for the show. I love discovering great new music, and as I say at the end of every show, “there’s great music out there, you just have to look for it.” So I hope you will join me on a future Monday afternoon at http://uicradio.org/ !